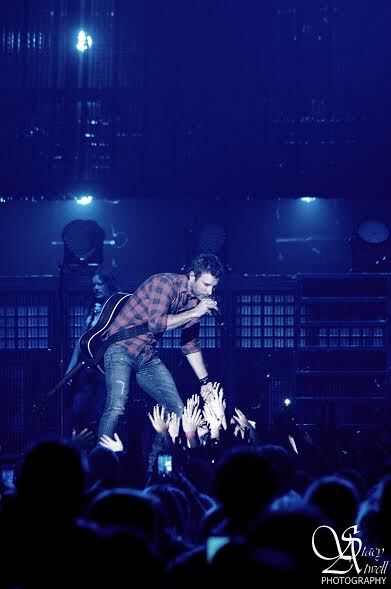 Thousands of fans stood and cheered as country singer Dierks Bentley took the stage on Saturday night at Royal Farms Arena. 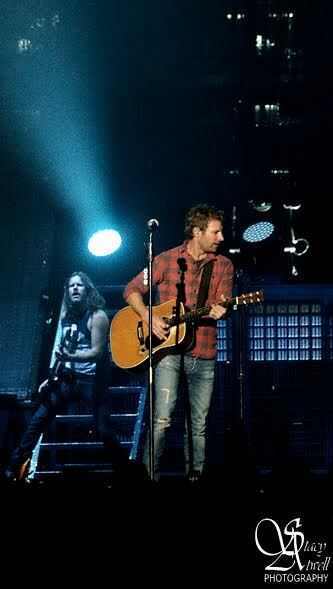 They were there for the last U.S. stop of Bentley’s final 2014 tour before he heads to Canada for a string of performances. “It’s because everyone heads to Canada in December, right?” Bentley joked between songs. Amid the applause, Bentley immediately launched into “5-1-5-0,” a quintessential country song about instant love. It’s a hearty, vivacious song that cheerfully professes instant infatuation (“Think I’m losin’ my mind, girl, 5-1.5-0, just this side of loco”) and it set the tone for a more famous song, “Am I the Only One?” The song laments the fact that no one around him seems ready to party. But the 4,000 fans standing and cheering were ready to party, and Bentley knew it. “It was the last stop in the tour, up in Baltimore,” he ad-libbed in the middle of the song as the crowd roared back. “Am I the Only One?” is a song that’s perfectly suited to Bentley’s personality. 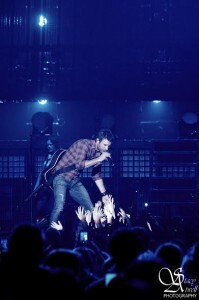 Watching him perform, it’s clear that he’s a naturally gregarious guy who enjoys the outreach to fans. “You all don’t know how honored I am to be here tonight,” he told them, and seemed to mean it. He stooped from his stage to high-five a few hands that were held out for him, and even took gulps from some beers that the fans laid out on the stage for him. “You put them out for me, they’re fair game,” he said merrily. It’s an exhortation to everyone who has been knocked down severely by life at some point. And Bentley had another personal tribute ready that night, as he called six men on stage for an introduction. “These guys look like you and me,” he told the audience. “But they’re not you and me… these guys are U.S. Navy SEALS.” When the applause had begun to subside, he explained how the next song, “Home,” was about them and countless others. Those serious messages didn’t seem to clash with the purely light-hearted songs that came later. “Drunk on a Plane” came equipped with a rowdy music video in the background, as an entourage swilled beer and champagne in the cabin while Bentley, wearing a pilot’s visor, led the way. Maybe Bentley just has good reason to celebrate. “Riser” is on a tear since its February 2014 release, having already sold a quarter million copies. He’s been nominated for a Grammy Award for the 11th time, and “Home” has become a chart-topping hit, marking 12 No. 1 songs for Bentley so far in his career as a singer and songwriter. And at age 39, he’s a long way from done. The concert wasn’t exactly a sold out – even with thousands in attendance, there were some notably empty seats. But for the man who vividly remembers driving from Phoenix to Nashville to try his hand at a new life making music, that’s probably fine for now. Bentley’s musical success hasn’t come overnight with the accolades from any one song or album, and unlike many other musicians, his rise to fame seems to have taken off at a linear rather than exponential rate. But the linear advance has its benefits: Instead of the usual ups and downs, each year just seems to be better than the last for Bentley as each album marks a new career high. And for a guy who road tripped to Nashville with only his Dad and a dream, it’s a good place to be.